Charges allege Mexico consulate blacklisted unionized Mexican migrant workers in B.C. 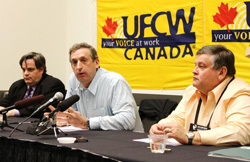 (L-R) Chris Buchanan, Lawyer; Wayne Hanley, National President, UFCW Canada; and Ivan Limpright, President, UFCW Canada Local 1518, detail the charges at a May 10 media conference in Vancouver. VANCOUVER, B.C. – May 10, 2011 – A leaked document has been deposited with the British Columbia Labour Board to back up charges that the Mexican consulate in Vancouver allegedly blacklisted Mexican migrant workers who were union sympathizers from returning to Canada this season to the two Lower Mainland farms where those workers had successfully unionized. The charges were filed by UFCW Canada Local 1518 — the union which represents migrant farm workers at Floralia Farms, and Sidhu Nurseries near Surrey, B.C. Both agriculture operations employ migrant workers from Mexico who come to Canada each season under the Canadian Seasonal Agricultural Workers Program (CSAWP). Union organizing drives at both locations succeeded after a majority of migrant workers at each location voted to unionize. Collective agreements were reached with both employers that guaranteed the migrant workers seniority, and first right of recall to be hired each season and return to Canada. But in charges now in front of the BCLRB, UFCW Local 1518 has deposited evidence that the Mexican consulate in Vancouver allegedly blacklisted some workers from returning because they were union sympathizers, and warned some workers at the two farms to stop visiting support centres for farm workers run by the union in the Lower Mainland. “The workers at Floralia and Sidhu wanted a union and we will continue to fight for their rights, and their safety, and their guarantee under their contract to return to Canada,” said the Local 1518 president. UFCW Local 1518 is part of UFCW Canada — the country’s largest private-sector union and a leading advocate for farm worker rights, which along with the Agriculture Workers Alliance (AWA) operates ten agriculture worker support centres across the country.